Along the walls of Grace Church, there are fourteen beautiful plaques. 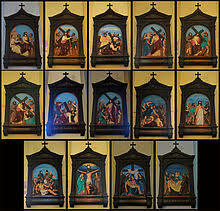 Each one is a station of the cross. During Stations of the Cross, participants will walk through the church and focus on each station with an accompanying reading or psalm. The stations represent Jesus’ betrayal, arrest, trial and death. The Stations provide a different way to experience Holy Week with sight, sounds, and movement. The times of Stations of the Cross are significant. Jesus was crucified at noon and drew his last breath around 2:30 p.m. This is a child focused reenactment of the stations of the cross, with an opportunity to ask questions about the events of Holy Week.During Stations of the Cross, participants will walk through the church and focus on each station with an accompanying reading or psalm. The stations represent Jesus’ betrayal, arrest, trial and death. The Stations provide a different way to experience Holy Week with sight, sounds, and movement. The times of Stations of the Cross are significant. Jesus was crucified at noon and drew his last breath around 2:30 p.m. The Good Friday service at 7:30 p.m. is just a liturgy; there is no Holy Communion, symbolizing Jesus’ departure on the cross. The liturgy is a combination of readings, reflections and choral interludes. This year during the service, the choir will be accompanied by a cello instead of the organ, reflecting the mood of the service. It is a service of mourning the death of Jesus and the sins of the world. At Grace Church this is the last somber service, before the celebration of Easter Vigil.